Passionate about quality, we at Niteesh Homes believe in giving our customers the kind of living spaces that we would like to live in ourselves. which is why, great thought goes into planning every single project that we undertake, right from identifying the perfect location to the world-class amenities & immaculate planning. We at Niteesh Homes greatly value your time and money.we understand that not only should your home be a refuge from the storms of life, but should also offer good Return On Investment(ROI).Delivery schedules are strictly adhered to and value-for-money is not just another buzz word with us but a business philosophy.We indeed have a prime focus on building communities that inspire and celebrate life. Hessaraghatta Road area exactly parallel to the New Airport Road. It has potential scope of enormous development in the next few years, considering the new proposed connectivity of Peripheral Ring Road. Address: no.3,1st Floor,15thmain,1st Cross,ward no.7,E Block, Sahakarnagar, Sahakara Nagar, Bangalore, Karnataka, India. 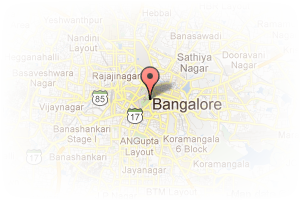 This Builder Profile page for "Niteesh Homes Pvt Ltd" has been created by PropertyWala.com. 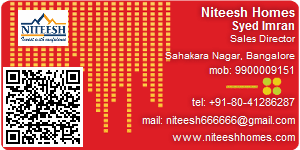 "Niteesh Homes Pvt Ltd" is not endorsed by or affiliated with PropertyWala.com. For questions regarding Builder Profiles on PropertyWala.com please contact us.